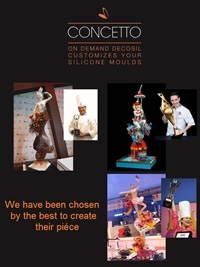 From the artistry in sugar modelling of the World Champion Davide Malizia and thanks to the decosil® experience in working silicone mould, it comes a new professional range of moulds with shapes dedicated to the creation of sugar and chocolate showpieces. Decorated spheres, strips and mats for showpieces, these moulds are designed to help, all those which compete in contests and competitions of high pastry, to show their art and creativeness. It was born the synergy between decosil® and The Star of Sugar 2013 winner, Davide Malizia, that offers a 360° consultancy to realize magnificent sculptures with custom moulds created and designed exclusively for each competitor who want to amaze the jury.